Three tiers of beautiful snowflake boxes greet you with delicious white chocolate covered pretzels, an assortment of mixed nuts and dried fruit. 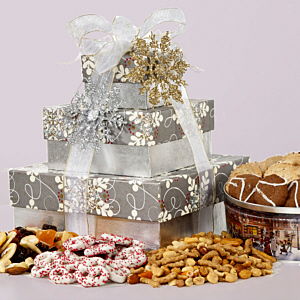 For the sweeter tooth, a decorative holiday tin filled with mouthwatering butter cookies also tags along. Festive ribbon wrap and two glittering snowflakes add a bit of sparkle to any office or home!